Florida’s leading sustainable home builders launch two new models. Green Dwellings is excited to announce two additions to its award-winning line of residential sustainable solar houses. The Breeze 1 and Breeze 2 models utilize state-of-the-art building techniques, renewable and recycled materials, and innovative design that meet the highest hurricane standards — and the highest homeowner standards. The Breeze 1 is a one bedroom/one bath home. The 716-square foot model is priced at $159,000. Breeze 2 features two bedrooms/two baths in a larger 1148 square foot space. It is priced at $229,000. Both offer dramatic great rooms with 12-foot ceilings and ample built-in storage. The designs are fresh, airy, contemporary, and smart. Green Dwellings seamlessly integrates energy-saving techniques throughout the homes, including LED lighting, Energy Star appliances, water-conserving dual flush toilets, low-flow fixtures, and more. Other energy- and cost-saving features include hidden solar electric and solar hot water panels, designed to reduce or eliminate utility bills. With battery storage, the homes can be off the grid. The Breeze 1 and Breeze 2, as well as Green Dwellings’ other models, are LEED Platinum Certifiable. This is the highest level of certification available from the National Green Builders Association, which grades buildings based on hundreds of energy-efficiency criteria. Both the Breeze models are constructed in just three months and are permanently installed in one day. Green Dwellings is committed to saving customers time, as well as energy and resources. 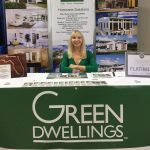 Winner of Sustainable Florida’s Best Practice Award for Green Building, Green Dwellings creates beautiful, healthy, sustainable, smart living spaces. Owners will reduce waste, carbon footprint, and utility bills. Leveraging industry-leading energy-efficient building techniques and materials, model homes offer residents in areas prone to extreme weather a safe, and elegant, choice. Homes arrive 90% finished, and Green Dwellings exceptional customer services ensures that the next 10% is convenient, easy, and streamlined.